Carbohydrates often have a terrible reputation for making you fat. In reality, too much of any food can make you gain weight. If your New Year’s resolution is to eat healthier and get in shape, you shouldn’t be taking carbs out of your diet. Carbohydrates can give you energy, burn off fat, boost your mood, and benefit your heart. Here are some of the many reasons why carbs need to be part of your daily diet. Carbohydrates are divided into three main groups: sugar, starch, and fiber. You can find them in natural foods, and by consuming them wisely, you can enjoy their many benefits. Sugar is a simple carbohydrate found naturally in dairy products and fruits. You can also find added sugar in cookies, cakes, soft drinks, and many other supermarket products. Sugar can help boost your energy levels, but if used excessively it can lead to high cholesterol, diabetes, obesity, and other health issues. Starch is a complex carbohydrate found in beans, starchy vegetables, and whole grains. If you consume starch smartly, you can get several health benefits such as extra energy, nutrients, and fiber. Have you noticed that you feel happier after eating carbs? That’s because carbohydrates in the right amount promote the production of serotonin. Serotonin is a feel-good brain chemical that boosts your mood. Studies show that people who follow a very low-carb diet are more susceptible to depression and anxiety compared to people who consume more healthy carbohydrates and less fat. The first thing you think about when you think of losing weight is getting rid of carbs. When in fact, carbohydrates are crucial for weight loss. Natural fiber can only be found in carbohydrates. Fiber helps control your weight because it adds bulk to your diet and helps you feel full quicker, and remain satisfied for longer. It will be easier to stay away from unhealthy snacks. Carbohydrates are an excellent source of fuel. Your body breaks down the starches and sugars found in carbs and absorbs them into your blood mainstream. Afterwards, they become glucose or blood sugar. Blood sugar is necessary to have the energy to perform all your bodily functions. Without enough carbs, you can feel weak, lethargic, and unfocused. If you need a tasty energy booster, head to your local bakery in Newtonville. Great Harvest of Newtonville has a variety of whole grain treats that will satisfy your energy needs. Give them a call at (617) 928-1162 to learn about their healthy options. Remember serotonin, the hormone that makes you feel happier? It also makes you feel sleepier at night. The right amount of carbohydrates will help you have a better quality sleep so you can be wake up fresh in the morning. 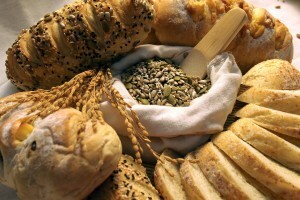 Adding more whole grains to your diet can help you reduce body fat. Carbohydrates such as oatmeal or whole grain cereal consumed three hours before exercising can help you burn off more fat. “Slow-release” carbs like whole grains don’t spike your blood sugar and insulin levels. Insulin helps signal your body to store fat, so if you have lower insulin levels, you’ll begin to save less and less fat. You should know that not all carbohydrates will help you burn off fat. You need to look for the ones with low calorie and high dietary fiber content. Usually, you’ll find them in fruits and veggies. The fiber found in carbs promotes healthier skin. Fiber helps bind cholesterol and gets toxins out of your body. Some toxins prevent proper blood flow making your skin break out and unhealthy. Fewer toxins mean more radiant skin. Tufts University conducted a study where a group of overweight women followed a low carb diet for a week, while another group followed a low-calorie diet. The women who ate fewer carbs did worse on working memory and visuospatial memory tests than their counterparts who consumed fewer calories. Carbohydrates are necessary for a sharper memory. You can get your dose of complex carbohydrates from whole grain bread at Great Harvest of Newtonville. Bread is a delicious source of fiber and nutrients, and you can find it freshly baked at your favorite bakery in Newtonville. Go ahead and give them a call at (617) 928-1162 to learn all about their products and monthly menus.